The drifting sands of the Namib-Naukluft National Park, the all-encompassing emptiness of Etosha and the palm-fringed streets of Swakopmund all feature on this memorable self-drive holiday. The real advantage of a self-drive adventure is being able to plan your itinerary to suit you, stop whenever you want to capture the photographs you might otherwise miss and visit the sights that intrigue you the most. And in Namibia, there is plenty to command your attention. The desert-adapted elephants, rhinos, hippos, giraffe and zebra of the Etosha Heights Private Reserve, for example, or the temporary lakes of Sossusvlei. Not to mention the remarkable rock art of Damaraland and famous jewellery shops of Swakopmund. Flights, full board at SafariHoek Lodge, half board at Desert Homestead Lodge, Mowani Mountain Camp and Erongo Wilderness Lodge, and bed & breakfast at The Delight Hotel. Based on two people travelling. Fly to Windhoek, via Johannesburg. At Windhoek, you’ll be met and taken to your stylish boutique hotel close to the city centre where you can relax after your flight. Your hire car will be delivered to the hotel. Today you begin your self-drive. Your first port of call is a private reserve just 30km from Sesriem and close to the UNESCO-listed Namib Sand Sea – the world’s only coastal desert. A fitting start to this most surprising of African countries, you’ll be perfectly positioned for exploring the Namib-Naukuft National Park and incredible attractions like Sossusvlei and the Sesriem Canyon. The region proliferates in vleis (temporary lakes) fed by waters from the Naukluft and Tsaris Mountains, so it attracts huge numbers of thirsty animals; both hunters and prey. The area is home to desert-adapted wildlife like ostrich, springbok, gemsbok, porcupines and aardwolf. Local predators include jackals, spotted and brown hyenas, Cape foxes and the aptly named bat-eared fox. As well as exploring nearby walking trails, you’ll have the opportunity to roam the desert on horseback – a really magical way to discover the surroundings. Continue your drive through the desert and you’ll reach an oasis of civilisation in a sea of wind-carved sand. Like the local wildlife, Swakopmund is also desert-adapted and surprisingly green – featuring luxuriant gardens and palm-lined streets. There are plenty of good local restaurants and enthusiastic shoppers will delight in the fine jewellery shops for which the town is known. 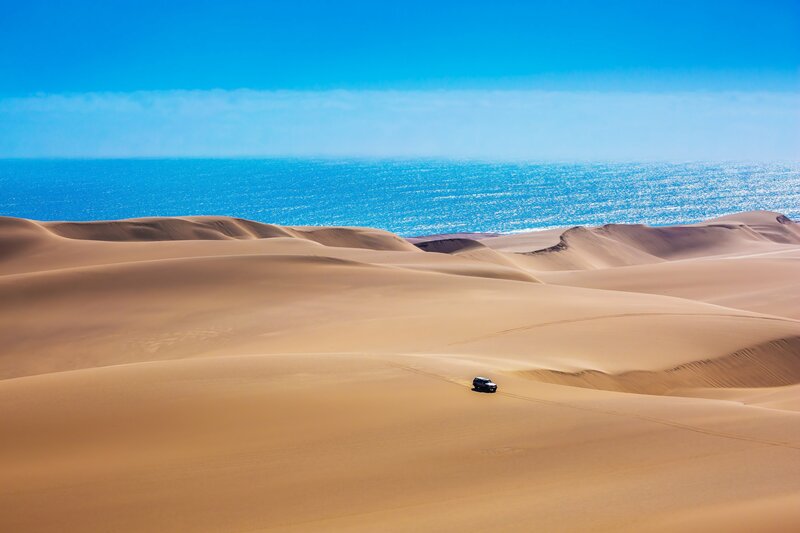 Swakopmund is a great base for exploring the bleak Skeleton Coast – where the sand dunes meet the sea – in a 4×4, as well as visiting the seals at Pelican Point or touring Sandwich Harbour. Your next stop is the Twyfelfontein Conservancy at the heart of southern Damaraland. A region filled with impressive geological formations and wildlife ranging from zebra to springbok and cheetah. Bird watchers will have the opportunity to see martial eagles and lappet-faced vultures, as well as endemic varieties like Rüpell’s Korhaan. Your camp is nestled high up amongst boulders with far-reaching views across the ancient landscape. An expedition to the World Heritage Site of Twyfelfontein, with its exquisite San art engravings and rock art, is a must, as well as the geologically-remarkable Organ Pipes and Petrified Forest. You’ll also have the opportunity to enjoy nature drives in search of the region’s magnificent elephants. Spectacular scenery accompanies you on the drive to the Etosha Heights Private Reserve which borders the renowned Etosha National Park. Your camera will be calling out to you and the temptation will be to stop every few miles to take advantage of the unrivalled photo opportunities offered by the region’s landscapes. And it doesn’t stop when you arrive at your hilltop camp. You’ll be surrounded on all sides by flat savannah interrupted only by the occasional tree or spiky bush. At first glance a totally inhospitable wilderness, the reserve is full of unique wildlife who traverse the landscape in a free and unobstructed way. Early morning and afternoon game drives could bring you up close to the elusive black and white rhino, mountain zebras, lions, elephants, giraffes and numerous species of antelope. Don’t miss out on a game drive after dark. Your next drive brings you to an exclusive wilderness lodge situated in an isolated valley just outside of Omaruru. Perched on the edge of an ancient volcano, the camp is surrounded by desert, bushveld and the dramatic Erongo Mountains. You can spend your time here indulging in fine wine and dining, relaxing by the swimming pool or lounging on the outside deck where you can drink in stunning views of the mountainous landscape. For those looking to venture further, expert local guides lead fascinating walks to discover the area’s unique fauna and flora, whilst also providing an insight into the diverse ecosystems and folklore of the Erongo bushveld. The birdlife is exceptional, featuring both raptors and tiny sunbirds, whilst the ancient rock art at “Paula’s Cave” makes for a fascinating visit. Today you will drive yourself to Windhoek International Airport, drop off your hire car and check in for your flight to Johannesburg. There you’ll connect with a British Airways flight back to London Heathrow.